Google Analytics Breakthrough is a much-needed comprehensive resource for the world's most widely adopted analytics tool. Designed to provide a complete, best-practices foundation in measurement strategy, implementation, reporting, and optimization, this book systematically demystifies the broad range of Google Analytics features and configurations. Throughout the end-to-end learning experience, you'll sharpen your core competencies, discover hidden functionality, learn to avoid common pitfalls, and develop next-generation tracking and analysis strategies so you can understand what is helping or hindering your digital performance and begin driving more success. Millions of organizations have installed Google Analytics, including an estimated 67 percent of Fortune 500 companies, but deficiencies plague most implementations, and inadequate reporting practices continue to hinder meaningful analysis. 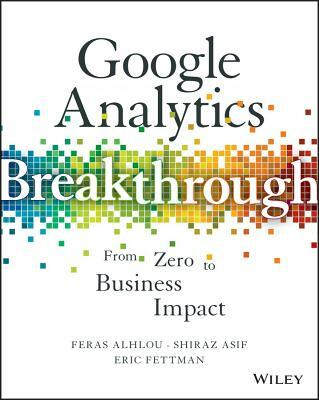 By following the strategies and techniques in Google Analytics Breakthrough, you can address the gaps in your own still set, transcend the common limitations, and begin using Google Analytics for real competitive advantage. Critical contributions from industry luminaries such as Brian Clifton, Tim Ash, Bryan and Jeffrey Eisenberg, and Jim Sterne - and a foreword by Avinash Kaushik - enhance the learning experience and empower you to drive consistent, real-world improvement through analytics. FERAS ALHLOU is co-founder and Principal Consultant at E-Nor (founded in 2003). He's built an industry-thought-leader organization providing marketing intelligence solutions to some of the world's most recognized brands. SHIRAZ ASIF is co-founder and Vice President of Analytics at E-Nor. He has extensive background in solutions architecture for Web and mobile analytics, report automation, and data analysis. ERIC FETTMAN is a founder of E-Nor Analytics University and an analytics trainer at E-Nor. He seeks to empower his students in digital analytics and optimization as well as all professional endeavors.